For Zummack, it was not ideal, nor was the Chiefs’ performance without him. They went 1-4-0-1, combining for just seven goals in five of those games. But while he watched, Zummack was determined to make the best of it. That’s typical, said teammate Ty Smith, who lived two years with Zummack and still FaceTimes with him regularly after practices and games. 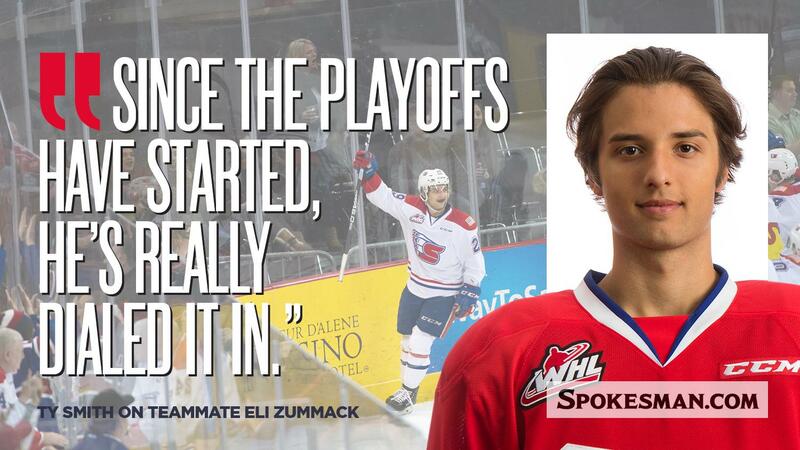 Through eight playoff games – including a 4-1 opening-series victory over the Portland Winterhawks – Zummack has six assists and three goals, good for the second-most points on the team. That comes after the 18-year-old’s best regular season in the WHL, a 53-assist, 15-goal performance that included a team-high six winners and 25 points on the Chiefs’ league-leading power play. A lot of that production came away from his natural position. Lined up with Jaret Anderson-Dolan – an NHL second-round draft pick last year – and Luke Toporowski, expected to be an NHL draft selection in June, Zummack said his statistics are a product of his fortunate position on a line with two great players. But Smith doesn’t buy that explanation. No NHL teams selected Zummack during his draft year last June, although shortly after he accepted an invitation to the Toronto Maple Leafs camp. “That was an amazing experience,” Zummack said. Some projections have Zummack, an 18-year-old, as a late-rounder this June. Spokane forwards Adam Beckman and Toporowski are projected as midround picks. Zummack’s particular skill set, teammates and coaches said, is his ice vision and ability to create opportunities for others. But Zummack seems to have an eye for passing lanes. Zummack is not a particularly big player at 5-foot-9, 179 pounds. But he is intent on getting better by mimicking pros, Smith said. Zummack has a handful of teammates who have spent time with NHL clubs, but he also watches NHL games on TV with the same critical eye he brought to the ones he watched from the Arena stands. “He’s been watching NHL players shift by shift, just to try to improve his game and see the little things they do,” Smith said. “Not so much with the puck, but away from the puck – their work ethic, little things like that, how they back check, finish checks, their position on the ice. Published: April 11, 2019, 7:16 p.m.